Normally I only decorate for Christmas but I’m starting to decorate for other seasons as well. 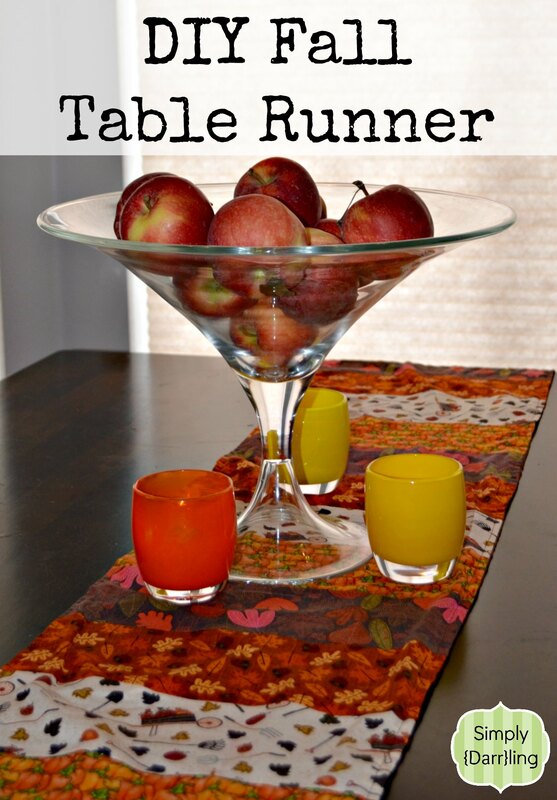 Last week I made myself an easy table runner and am sharing the tutorial with all of you today. This tutorial can easily be changed depending on how long you would like it. First for the fun part. Head to your local fabric store and select 4 coordinating fabrics. When you are picking out fabrics, consider things like size and direction of the pattern. 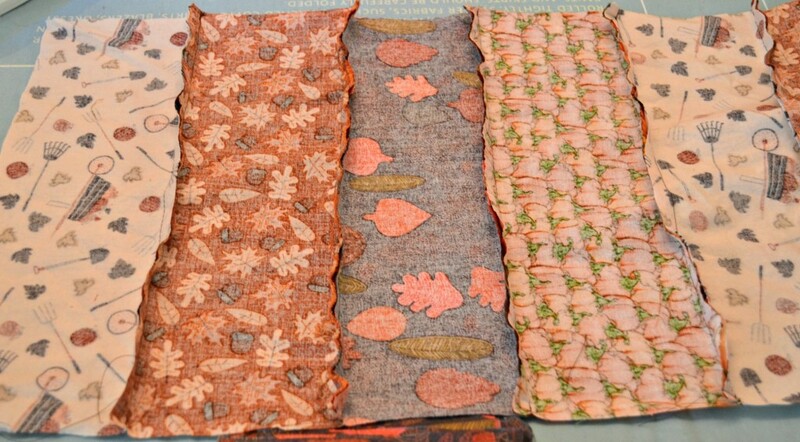 I bought 1 yard of each fabric which has allowed me to make 5 table runners. 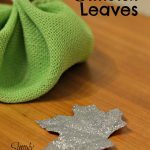 If you only want to make one; you could buy less fabric (more on determining how much you need later). For my table runner, I used 4 rectangles of each fabric which gave me a finished length of 64 inches. If you want a different length just change up how many rectangles you sew together. You also need to buy backing fabric, I used coordinating broadcloth, but you could easily do another fall fabric. Since i was making multiple runners, I bought 2 yards so that I didn’t have to piece it together. Once you wash and dry your fabric, it’s time to start cutting. 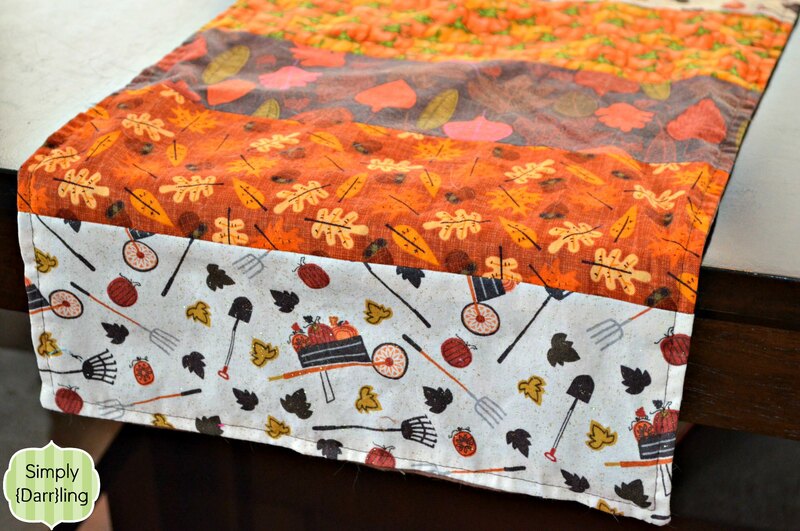 For this table runner, I used 13″x5″ rectangles for a finished dimension of 12″ x 4″. With one yard of fabric, there are two different ways to cut out these triangles. One way will give you 16 pieces/yard and the other will give you 21/yard. This is the reason that the direction of the pattern matters. If you are trying to make more than one you want to make sure that the 1 yard will make enough rectangles. 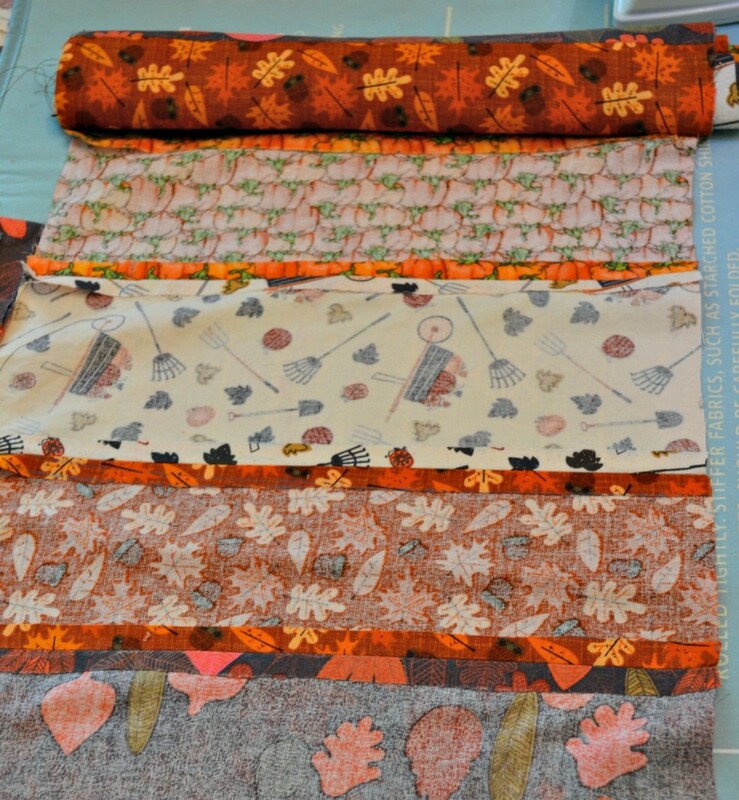 Below is an image showing the different ways to cut the fabric; it does not show the extra fabric not used in the table runners, the 36×44 is the 1 yard measurement. As you can see above, option 1 allows for more rectangles to be cut out. If the pattern doesn’t allow for this layout then you might need to buy extra fabric. If you are only making one table runner then you can order less fabric (the number that is changeable is 36 in the image above). Once all the fabric is cut out it’s time to start sewing. I piled each of my fabrics in the order that they were going to go so that I could just grab down the line as I sewed. Take two rectangles and put them right sides together. 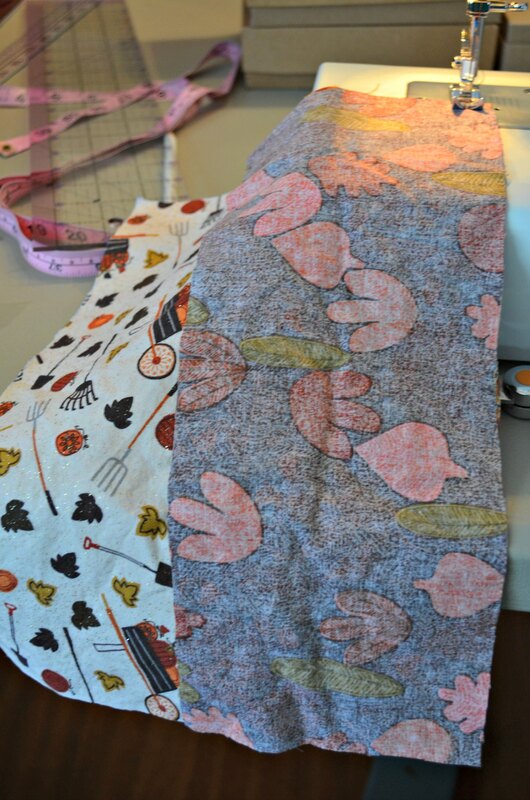 Sew lengthwise with 1/2 inch seam allowance. Open up and then take the next fabric piece in line and place it right side together with the previous piece. Continue this same pattern until you have the desired length. Before attaching the backing, iron all of the seams open. To cut the backing, I laid the sewed pieces face down on the backing fabric then cut around it to account for any variance of my sewing/original cutting. Then pin the two pieces together and sew together with a 1/2 inch seam allowance. Make sure to leave about a 3″ opening to flip it back right-side out. Clip the corners then flip right-side out and push out the corners. Iron the entire table runner then sew all the way around with 1/4 inch from the edge to sew the opening closed. If you have questions, feel free to leave a comment or email me. I do my best to respond to all comments and emails. 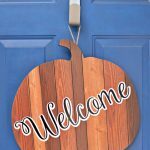 Have you started decorating for the fall season? What have you done? Cute! I have a burlap-lace table runner in the works. 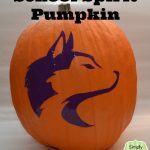 I love the fall themed one! 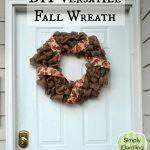 I can be lazy with the burlap one and just leave it out for Christmas too. Haha. Great job and thanks for the DIY! Burlap-Lace sounds adorable! I love the idea of re-using it for Christmas. That would be cool to have it be reversible. Let me know how it turns out if you make one!